Today's salad recipe is brought to you by the vegetable: Beetroot (Beets). As the weather warms up, and the heavy jackets come off...looking in the mirror. It's time for SALAD. Shoozlife is bringing you a series of salads that will keep you satisfied and looking good for the Summer months. Pre-heat the oven to 250 degrees (400 Fahrenheit). Place the beetroot in an aluminium foil tray, drizzle over the olive oil and shake to coat. Season with salt and pepper. Roast for 30-40 mins, turning occasionally. Set aside to cool. While the beets are cooking, place the Lebanese bread in the oven for 5-10mins, until crispy. Keep an eye on it so it doesn't burn. Break up into pieces. 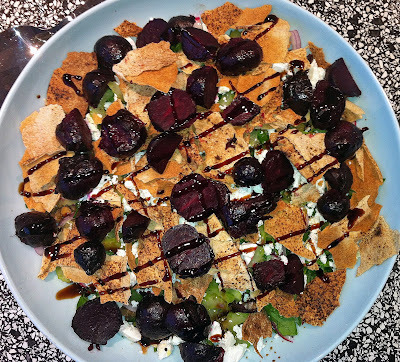 Combine all ingredients in a large salad bowl, leave the cheese and beets for the top. For the dressing, combine the ingredients and shake. Pour over the salad.